"Dream Interpretation and False Beliefs," Professional Psychology: Research and Practice 30(1):45-50 (February 1999). Dream interpretation is a common practice in psychotherapy. In the research presented in this article, each participant saw a clinician who interpreted a recent dream report to be a sign that the participant had had a mildly traumatic experience before age 3 years, such as being lost for an extended time or feeling abandoned by his or her parents. This dream intervention caused a majority of participants to become more confident that they had had such an experience, even though they had previously denied it. These findings have implications for the use of dream material in clinical settings. In particular, the findings point to the possibility that dream interpretation may have unexpected side effects if it leads to beliefs about the past that may, in fact, be false. Part of this study was supported by a MURST Grant. Correspondence may be addressed to Giuliana A. L. Mazzoni, Department of Psychology, University of Florence, via S Niccolo'89/a, Florence, Italy, 50125. Dream interpretation is a common current clinical tool used more in some therapies than in others ( Brenneis, 1997 ). Although this tool might not necessarily be problematic as an enterprise, what would be the impact and consequence of a clinician imposing an incorrect interpretation on dream material? Could sbuch misinterpretation influence patients' beliefs about their past in ways that might be detrimental? Could patients be led to false beliefs about their past? Dream material was viewed by Sigmund Freud (1900/1953 , 1918/1955 ) as providing a royal road to the unconscious and as being a vehicle for unearthing specific traumatic experiences from the past. Psychoanalytic theory and technique (including dream interpretation) dominated psychotherapy training well into the 1950s, when behavioral, humanistic, and cognitive approaches, which do not emphasize dream interpretation, began to have greater impact. Dream interpretation, or dream work, holds a far less central position among clinical intervention tools than it did just 30 years ago. Does this sort of clinical dream interpretation actually lead to the recovery of a genuine traumatic past? Or is it possible that the dream interpretation might be leading people to develop false beliefs, or even false memories, about their past? And if so, is it harmful? We recently published several studies that may have some relevance to these questions ( Mazzoni & Loftus, 1996 ). We showed that after a single subtle suggestion, participants falsely recognized items from their dreams and thought that these items had been presented in a list that they learned during the waking state. Our participants first learned a key list of words. In a later session, they received a false suggestion that some items from their previously reported dreams had been presented on the key list. Finally, in a third session, they tried to recall the items that had occurred on the initial key list. A major finding was that participants often falsely recognized their dream items and thought they had been presented on the key list, sometimes as often as they accurately recognized true list items. Despite the high rate of false recognition, and the conviction that participants had about these false memories, it is reasonable to question whether the same kind of results would occur with more personally meaningful events. We devised a new methodology for exploring whether such activities can lead people to develop false beliefs about the past. We found individuals who reported that it was unlikely that they had had certain critical experiences before the age of 3 years. The age of 3 years is important to shed light on whether changes that resulted from our manipulation were due to the recovery of true experiences or the creation of false ones ( Wetzler & Sweeney, 1986 ). The critical experiences included episodes like being lost in a public place for some extended time. Later, some of these individuals went through a 30-min minitherapy simulation with a clinical psychologist, who interpreted their dream (no matter what the content of the dream) as if it were indicative of having undergone specific critical experiences in the past. An initial group of 128 undergraduates from the University of Florence filled out an instrument that we called the Life Events Inventory (LEI) on which they reported on the likelihood of various childhood events having happened to them. The LEI has 36 items, 3 of which are critical items. The inventory asks participants to consider how certain (confident) they are that each event did or did not happen to them before the age of 3 years. Participants respond by ranking items on an 8-point Likert-type scale ranging from 1 ( certain it did not happen ) to 8 ( certain it did happen ). Fifty participants who had low scores (below 4) on the 3 critical items were selected and asked to participate in the next phase of the study. The 3 critical items were as follows: "got lost in a public space," "was abandoned by my parents," and "found myself lonely and lost in an unfamiliar place." The cover story associated with the administration of the LEI explained that the study concerned the frequency of rare and common events that happened during early childhood and that the study goal was the validation of an instrument to measure these experiences. Of the selected 50 participants, half were randomly assigned to a dream condition, where they received suggestive information about the content of their dream. The other half did not receive any suggestive information about their dreams. Of the 25 participants in the dream condition, only 19 completed all three phases of the experiment; all 25 participants in the non-dream condition completed the experiment. (The difference in completion rate appeared to be due to a handful of participants who were randomly assigned to the dream condition but chose not to participate in what they thought was an additional experiment. Whether this choice was due to already having sufficient credits or some other reason was not explored.) The mean age of the final sample of 44 participants was 21 years, and 64% were women. All 44 participants returned to take the LEI again after 3 to 4 weeks. However, those in the dream condition also participated during that time in what they thought was a completely different experiment but was actually the dream manipulation. For the participants in the dream condition, dream interpretation was done 10-15 days after the first LEI. Shortly before the dream session, dream condition participants received a phone call from a clinician asking for their participation in a dream and sleep study. Participants were asked to bring in one or more dreams, which could be a recurrent dream, a recent dream, or a vivid dream (no constraints were put on the type of dream). These participants had their dreams individually interpreted by a clinical psychologist. The particular clinician is a trained clinical psychologist with a private practice in Florence, Italy. He also is well known in the community from his radio program on which he gives clinical advice. Moreover, he has a strong, persuasive personality. In the dream session, the clinician welcomed the participants and explained that the purpose of the study was to collect meaningful dreams and to relate those dreams to sleep characteristics. Then the participants read their own dream report aloud. Next, the clinician asked participants for their own interpretation of the dream and for their comments on the dream. Then the clinician offered his own comments. The comments were framed in terms of a clinical interview (i.e., the psychologist followed a predefined script but was free to make some modifications depending on the responses of the participant). Early on, he explained that he had considerable experience in dream interpretation, and he explained that dreams are meaningful and symbolic expressions of human concern. A key feature of the dream manipulation was to suggest to participants that the dream was the overt manifestation of repressed memories of events that happened before the age of 3 years. To be specific, the dream interpretation suggested to the participants that the dream was indicative of a difficult childhood experience, such as getting lost in a public place, being abandoned by one's parents, or being lonely and lost in an unfamiliar place-the three critical items. No matter what the content of their dreams, all participants received the same suggestion: that one or more of these critical experiences appeared to have happened to them before the age of 3 years. To appreciate what the clinician did with the specific dream material, it is helpful to use a concrete example. Suppose a participant came in with a dream report about walking up a mountainside alone on a chilly day and commented that the dream must mean that he finds mountain walking appealing. The clinician might then discuss part of the dream, mentioning the mountain, that the participant reported being alone there, and that despite the participant's remark about liking mountain walking, the "chilly day" suggests that the experience might be a "cold" one for the participant. At that point, the clinician would try to induce the participant to agree with this suggestion. The clinician might then move toward a global interpretation, suggesting that in his vast experience with dream interpretation, a dream like this usually means that the participant is not totally happy with himself, he needs challenge, he resists being helped by others, and he might have social or interpersonal difficulties. The clinician then might suggest to the participant that the dream content, and the feelings about that dream, are probably due to some past experience that the participant might not even remember. The clinician would then tell the participant that the specific details mentioned are commonly due to having had certain experiences before age 3, like being lost in a public place, being abandoned even temporarily by parents, or finding oneself lonely and lost in an unfamiliar place. Finally, the clinician would ask whether any of the critical events happened to the participant before the age of 3 years. When the participant claimed not to remember these experiences, the clinician explained how childhood experiences are often buried in the unconscious but do get revealed in dreams. He commented on specific items in the dream and tried to relate those items to possible feelings that the participant might have. In the example, the specific items of the mountain walking and the chilly day were related to the possible feelings about its being a cold experience. He tried to induce the participant to agree with and expand on his interpretation. He provided a global interpretation of the dream's meaning. In the example, the clinician suggested that possibly the participant was not totally happy with himself, needed challenge, resisted help, and so forth. He suggested the possibility that specific events of childhood are commonly associated with dream reports like the one provided by the participant. In the example, the specific events were getting lost and feeling abandoned-in other words, the critical events used in this study for all participants. He explicitly suggested that such events had happened to the participant, and he asked for the participant's agreement with that suggestion. When the participant did not recall such an event, the clinician explained that unpleasant childhood experiences can be buried and remain unremembered but are often revealed in dreams. The entire dream session lasted approximately 30 min. At the end of the dream session, the clinician asked the participant to think over the proposed events and to return later for the sleep assessment. These participants eventually returned to participate in a subsequent sleep study that was actually totally unrelated to the current experiment. The initial experimenter, who had previously administered the LEI (hereafter referred to as LEI-1), then contacted the participants in the dream condition and arranged for them to return for a second administration of the LEI (hereafter referred to as LEI-2). Approximately 10-15 days passed between LEI-1 and dream interpretation, and an additional 10-15 days passed between dream interpretation and LEI-2. For the non-dream condition participants, the LEI administrations were separated by the same amount of time but without any intervening dream interpretation. After the LEI-2, participants were thoroughly debriefed. At this time, they were asked whether they had linked the two experiments in any way, and no participant reported having done so. To determine if the false dream interpretation had caused participants to become more confident that the critical events had occurred, we examined whether LEI scores moved up or down for each of the three critical items. We also calculated the percentage of participants whose responses increased, decreased, or did not change from the LEI-1 to the LEI-2. The data for the three critical items (lost in public place, abandoned by parents, and lonely and lost) are shown in Figure 1 . We predicted that after dream interpretation, participants would be more confident that the events had happened. Figure 1. Percentage of participants who decreased, who stayed the same, and who increased their scores for each of the three critical items on the Life Events Inventory. First examine what happened without dream interpretation: These participants in the control condition reported no change in score on two target items and a clear decrease on the remaining item ("lonely and lost"). The same was not true for participants in the dream condition. For all three items, their scores were far more likely to increase, and they rarely decreased on the LEI-2. For two of the critical events, about 80% of the scores increased. To analyze these data statistically, we conducted several Mann-Whitney U tests, comparing the dream and non-dream (control) conditions. We found that the two groups differed significantly for two of the critical items: "lost in a public place" and "lonely and lost in an unfamiliar place." Participants in the dream condition were far more likely to increase their confidence that they had had these experiences before the age of 3 years. The same differences between the dream and non-dream condition groups were found when we analyzed the degree of movement. For each participant, we calculated the numerical difference between the scores assigned to each item in LEI-2 and the scores assigned to the same items in LEI-1. 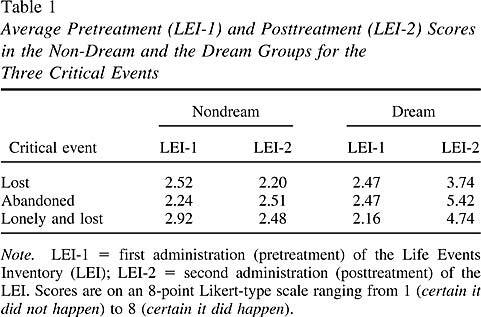 Figure 2 shows the change scores from LEI-1 to LEI-2 for the three critical items for non-dream condition versus dream condition participants. Figure 2. Mean change in scores on the Life Events Inventory (LEI) for each of the three critical items. At the right is mean change collapsed across the three critical items. As Figure 2 shows, for control condition participants, the changes in LEI scores were relatively small and not systematic. One item changed in a slightly positive way ("abandoned by parents"), whereas the other two items changed in a slightly negative way. For the dream condition participants, the picture was completely different. All three items changed in a positive direction. The biggest difference between dream and non-dream condition participants occurred for the item "lonely and lost in an unfamiliar place," where the dream condition participants showed a mean positive change of 2.58 and the control participants showed a mean negative change of -.44. At the right of Figure 2 , the mean change in LEI is averaged across all critical items and participants, and a strong overall influence of the dream interpretation can be seen. The mean change in the dream condition was 2.26 on the 8-point scale, whereas in the non-dream condition it was -.16. To analyze these data statistically, we conducted several students' t tests for independent samples on the change scores. We found that the dream and non-dream condition participants differed significantly for two critical items: lost in a public place and lonely and lost. Dream and non-dream participants differed on the last critical item, abandoned by parents, only by a one-tailed test. Thus, the two methods of analysis, one that involved proportions of participants who shifted and one that involved measures of mean shift, produced similar results. To be sure that our results were not due to inadvertent differences in pretreatment LEI scores, we calculated the mean pretreatment score for each critical item. These pretreatment scores are shown in Table 1 , separately for dream and non-dream participants. The posttreatment mean scores are also shown. Notice that the dream and non-dream participants did not differ in terms of their pretreatment scores, but they showed large differences in their posttreatment scores. The previous two analyses suggested that the dream manipulation caused participants to become more certain that they had had specific negative experiences in their early childhood. A question then arose as to whether the shifts were localized only to the specific experiences mentioned by the clinician, or whether the clinician's intervention caused a general negative feeling, creating in participants the belief that they were more likely to have experienced a vast array of negative events in their early lives. We assessed this possibility by examining the dream condition versus non-dream condition differences on the negative filler items, such as "witnessed a person dying" or "threatened by a stranger." If the dream manipulation produced general negativity, this negativity might be represented in increased confidence on negative filler items as compared with non-dream condition responses on those negative filler items. In fact, we found that the dream manipulation had no impact on the negative filler items. Rather, the influence of the dream manipulation was very specific to the critical items that were specifically mentioned by the clinician. Why did the dream interpretation lead to increased confidence that certain suggested events occurred? One possible explanation is that the dream interpretation created a true belief, reminding some participants of a true experience from their past. Such a reminder, if it occurred, probably did not occur during the therapy session itself, because no participant reported a memory for one of the critical events during the therapy. However, in the 10-15 days between the therapy and the final session, some participants might have recalled an actual experience. We deliberately suggested critical events to have occurred before the age of 3 years so that any memory that was produced could be deemed unlikely to be a real memory because of the childhood amnesia problem. However, it is entirely possible that the therapy might have led to ruminations that reminded participants of an event that occurred after the age of 3 years, but they misdated the experience during LEI-2 and mistakenly thought that it occurred before the age of 3. This process would lead to dramatic shifts in the LEI. Our data cannot rule this possibility out completely, and it is possible that these kinds of cases accounted for some of the shift that we observed. However, we would argue that if participants were so ready to conclude after dream interpretation that an experience that they actually had at age 6 or 8 or 12 happened to them before the age of 3, this also would constitute a distortion of belief or memory. Another possible reason that participants increased their confidence in the suggested events is that the dream interpretation created a false belief. If false beliefs have been constructed, how and why does this process happen? One answer to this question can be found in the large literature on memory distortion that has shown that people are susceptible to suggestion ( Gheorghiu, Netter, Eysenck, & Rosenthal, 1989 ). In the current empirical work, we have found a form of suggestion that is both explicit and subtle. It is explicit in that the clinician used his authority to tell the dreamers that their mental products were likely to be revealing particular past experiences. It is subtle in the sense that the dreamers were encouraged to come up with their own specific instances of such experiences. Our findings have important implications for therapists. They show that people are suggestible in a simulation that bears more resemblance to a therapeutic setting than has been used in prior empirical studies. Moreover, the findings hint at the strong influence that a clinician can have in a short period of time. This power may extend to other therapist-client interactions that are characterized by therapist interpretation of information provided by the client. One might ask whether it is reasonable to generalize from our brief therapy simulation with students to the world of clinicians and their patients. After all, many of the differences between our minitherapy and real-world therapy are relatively easy to point out. Nonetheless, we believe that these very differences are such that we may be underestimating the power and influence that can occur in a clinical setting. We used students, who were presumably reasonably mentally healthy, whereas clinical patients may have a greater need to find an explanation for problems or distress. We had a single short therapy simulation, whereas clinical patients often experience many sessions during which suggested interpretations are offered to them. Our therapy simulation was limited to only a few elements that the participants provided (e.g., the dream and a brief reaction to the dream), whereas clinical patients provide a great many elements (dreams, thoughts, behaviors, feelings) with which the therapist works. Whether these elements are critical for influencing how people reflect on their past experiences is, of course, a matter for further research investigation. One might ask whether it is even the case that therapists are using dream material to suggest that events occurred in a client's early life. We have found a number of examples that support the contention that some therapists do indeed make these kinds of suggestions from dream material. This conclusion comes not only from surveys of clinicians (e.g., Poole et al., 1995 ), but also from the writings of specific clinicians. For example, in Crisis Dreaming, readers are told, "Recurring dreams, particularly of being chased or attacked, suggest that such events really occurred" ( Cartwright & Lamberg, 1992 , p. 185). Are the authors of this book communicating this information to their clients? Are therapist-readers of this book taking dream material that involves chases and attacks and telling a client that it means that such events occurred? Although we cannot know that therapist-readers are following the advice implicit in this book, it is worth considering the likelihood that they might do so and might inadvertently create false beliefs or memories. Could therapists produce similar effects without explicit dream interpretation? We believe the dream interpretation is probably not necessary but might add a bit of influential power. Here is why: Suppose instead of interpreting dreams the clinician simply responds to the comments made by a client during the first 5 min of interaction. If the clinician takes that 5 min of material and interprets the material as being indicative of an early childhood trauma, the client may eventually come to believe that he or she experienced such a trauma. In fact, even in the absence of dream interpretation, such suggestive comments might increase the likelihood of illusory beliefs or memories. According to Lindsay and Read (1995) , suggestions from a trusted authority can be especially influential when they communicate a rationale for the plausibility of buried memories of childhood trauma. Moreover, the trusted authority might be especially influential if he or she offers repeated suggestions, giving anecdotes ostensibly from other patients. However, it is also worth pointing out that working with dream material might be a particularly potent way to influence clients, for better or worse. It certainly might help to enhance the influence process, because people presumably enter therapy with a set of beliefs about the meaning of dreams in their lives and how much dreams can reveal about an individual's past. Given a predisposition on the part of some clients to already believe in the significance of dreams, the trusted authority can capitalize on the a priori beliefs and use them in the service of altering the autobiography. Are therapists aware of the power they have? Almost by definition therapists must believe that they have the power to change people, because at least some forms of therapy emphasize changing people's beliefs from ones that are nonadaptive to ones that are more adaptive. Even more generally, therapy is about changing people. However, therapists may be appreciating their power to change people primarily when they are thinking about the good it can produce in people or thinking about ways to make their clients change for the better. They may not be appreciating that they also have the power to change people for the worse. This type of change can happen, for example, when a therapist adopts a hypothesis too early and, even when the hypothesis is wrong, presses it on the client. Our data show that even a randomly generated hypothesis can be embraced by individuals and can produce profound changes in the way they view their past. We have demonstrated that these interventions can make people believe that they have had experiences that they previously denied. However, it is also likely that these interventions have the power to make people doubt their true experiences. Our hope is that heightened awareness of this power might enhance the likelihood of cautious use of these sorts of interventions. Brenneis,C. B. (1997). Recovered memories of trauma: Transferring the present to the past. Madison, WI: International Universities Press. Cartwright,R. & Lamberg,L. (1992). Crisis dreaming-Using your dreams to solve your problems. New York: HarperCollins. Fredrickson,R. (1992). Repressed memories. New York: Simon & Schuster. Gheorghiu,V. A., Netter,P., Eysenck,H. J. & Rosenthal,R. (1989). Suggestion and suggestibility. New York: Springer-Verlag. Lindsay,D. S. & Read,J. D. (1995). "Memory work" and recovered memories of childhood sexual abuse: Scientific evidence and public, professional, and personal issues. Psychology, Public Policy, & the Law, 1 846-908. Mazzoni,G. A. L. & Loftus,E. F. (1996). When dreams become reality. Consciousness & Cognition, 5 442-462. Polusny,M. A. & Follette,V. M. (1996). Remembering childhood sexual abuse. , 27 41-52. Poole,D. A., Lindsay,D. S., Memon,A. & Bull,R. (1995). Psychotherapy and the recovery of memories of childhood sexual abuse: U.S. and British practitioners' opinions, practices, and experiences. Journal of Consulting and Clinical Psychology, 63 426-437.
van der Kolk,B., Britz,R., Burr,W., Sherry,S. & Hartmann,E. (1984). Nightmares and trauma: A comparison of nightmares after combat with life-long nightmares in veterans. , 141 187-190. Wetzler,S. E. & Sweeney,J. A. (1986). Childhood amnesia: An empirical demonstration. In D. C. Rubin (Ed. ), Autobiographical memory (pp. 191-201). Cambridge, MA: Cambridge University Press.